Keratin-17 (K17) is a cytoskeletal protein produced by keratinocytes (KCs), which is overexpressed in psoriasis and may play a pivotal role in its pathogenesis. Narrow-band ultraviolet B (NB-UVB) irradiation is used as a general treatment for psoriasis, although its impact on K17 expression has yet to be determined. In this study, we aimed to investigate the effect of NB-UVB irradiation on K17 expression and its signaling pathways. After exposure to NB-UVB irradiation, immortalized human keratinocytes (HaCaT cells) were analyzed by flow cytometry, CCK-8 assays and transmission electron microscopy to examine proliferation. Meanwhile, K17 expression in primary human epithelial keratinocytes was detected by quantitative real-time polymerase chain reaction (qRT-PCR), western blot analysis and immunofluorescence. HaCaT cells pre-incubated with PD-98059 and piceatannol were subjected to western blot analysis to examine ERK1/2 and STAT3 phosphorylation. The ears of mice treated with imiquimod (IMQ) and irradiated by NB-UVB were taken to examine K17 expression by qRT-PCR, western blot analysis, and immunofluorescence. Our results showed that 400 mJ/cm2 of NB-UVB irradiation was the maximum tolerable dose for HaCaT cells and could cause inhibited HaCaT cell proliferation and moderate increase of the early apoptosis. Furthermore, NB-UVB irradiation could downregulate K17 expression by inhibiting the ERK1/2 and STAT3 signaling pathways. 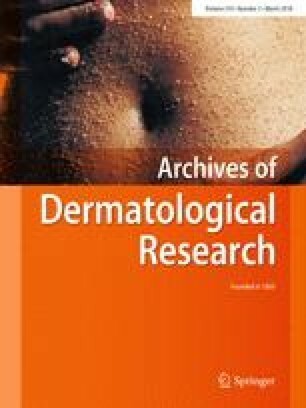 In experiments conducted in vivo, NB-UVB irradiation with doses of MED or higher could eliminate the IMQ-induced psoriasis-like dermatitis and inhibit K17 expression. These results indicated that NB-UVB irradiation may eliminate chronic psoriatic plaques by suppressing K17 expression via the ERK1/2 and STAT3 signaling pathways. Yuchen Zhuang, Changxu Han, Bing Li contributed equally to this work. The online version of this article ( https://doi.org/10.1007/s00403-018-1812-1) contains supplementary material, which is available to authorized users. This study was supported by the National Natural Science Foundation of China (Grant Nos. 81430073, 81402620, 81672692 and 81220108016). The study protocol was approved by the Medical Research Ethics Committee at Xijing Hospital of the Fourth Military Medical University (Xi’an China). Written, informed consent was obtained from all participants prior to the study.